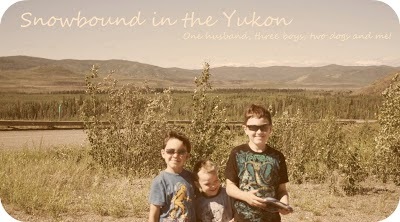 Snowbound in the Yukon: Just a another Friday. Things have been super busy lately. SmartGuy was in Art Camp and Swim Lessons and they both ended this week. I'm not sure what to do for July, I'm not sure that there is anything available for him to do besides more swim lessons but he can now start Level 1, which I'm pretty glad about. Hubby had some early nights and we got to go swimming as a family. Bugaboo has had a cold so we left him with Nana one night, Gramma is now called Nana, which I think is pretty cute because my Grandmother was Nana on my dad's side. Really there hasn't been much to report, hanging out with friends, I got to go to craft night one night but there was no one there so I just hung out a friends. We also got to hang with the same friend on Canada Day. We watched the parade, went to the park, went for lunch and then swimming where most of my other friends were with their children. It was a really great day! I'm also been having days where I want to do nothing but the boys just keep me busy. I'm just glad that they have things to do in the backyard. Also my parent just got back from the City and they bought a trampoline with a net for the boys for the back yard. My dad and I are going to set it up tomorrow. We are getting another thunderstorm tonight, it's a been I think at least three nights now where we've had this but I guess no fires are picking up from it, which is good and bad at the same time. The guys are work don't have much to do and neither does hubby. Mickey had a few days of accidents that I mentioned earlier but he seems to have stopped that now. Me? I'm really not getting much done these days. While i did get my office more organized and my scrapbooking I just haven't had the time to do much with it. I'm working on a Storybook for my parents for Christmas. You download a program from Creative Memories and just add your photos to the ready made layouts and you order a book and they'll send it to you in the mail. I thinks it's a fabulous idea! So really, not that much to tell and just not enough time everyday to get online and check my blogs, message boards or post on here much. Hopefully things will pick up soon and I'll have more to report. I forgot to mention a few things. A red robin has discovered a buffet of insects in our back yard and has been hunting everyday. It's kind of neat. I've had bugs attacking me, a spurce beetle and a grasshopped both landed on my shirt today. I got a few things recently a new shade to go over my double stroller and it works pretty good but it doesn't have straps on the bottom so when it's windy it blows around a lot but it works great otherwise and if my toddler would quit putting it behind his head I'd be fine. I also go these Angel guard devices for the seatbeats in the car so my toddler can not get out of his seat repeatedly, well he got out of it the first day I got it. It's mightly hard for me to get it off so he must of really reafed on it. But I think he's given up on taking it off all the time. It'll at least give me a few minutes peace!